Purpose: The lipophilic carbonic anhydrase (CA) inhibitor acetazolamide has been shown to enhance subretinal fluid resorption, reduce subretinal pH, and can improve cystoid macular edema, but its clinical use is limited by systemic side effects. While these are most likely a result of inhibiting intracellular CA isoenzymes, retinal pigment epithelial (RPE) transport is thought to be modulated via membrane-bound CA. This study investigates whether benzolamide, a hydrophilic CA inhibitor that does not readily penetrate cell membranes, is sufficient to modulate subretinal volume and pH. 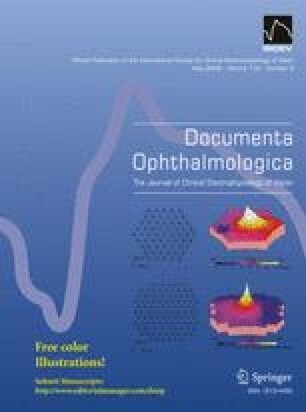 Methods: Volume and pH were assessed in the subretinal space (SRS) of the perfused chick retina–RPE-choroid preparation by calculating these variables from data obtained with two different double-barreled, ion-selective electrodes (H+ for pH and the extracellular space marker tetramethylammonium (TMA+) for SRS volume). Light induced variations and changes in baseline measurements were recorded before and after addition of 10-4M acetazolamide or benzolamide to the basal perfusion. Results: Basal perfusion with either drug induced both an acidification of the SRS by 0.02–0.04 pH units, which occured within 60 s, as well as an increase in the amplitude of the light-induced alkalinisation of the SRS. TMA+ concentration in the SRS increased steadily over a period of several minutes after basal perfusion with either of the CA inhibitors, and the calculated SRS volume was reduced by 40% within 8–10 min. Conclusion: The observation that benzolamide had effects equal to acetazolamide suggests that inhibition of membrane-bound CA at the basolateral membrane of the RPE is sufficient to decrease subretinal pH and volume. This may represent a clinically important mechanism for the resorption of sub- and intraretinal fluid.